Become a paragliding pilot ! For all the courses in our paragliding school Annecy, you will be supervised by a team of qualified professionals, to evolve in the practice of paragliding safely. 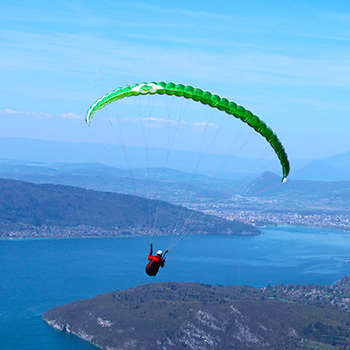 Our paragliding school Annecy runs on Annecy from April to October. We welcome you every day, always listening to our customers and their desires. Our internship formulas allow you to choose the most adapted to your needs and your desires. Take height in the air ! We propose you formulas adapted to your level and your desires. From simple baptism of the air to advanced training abroad, we answer various requests to develop your practice of paragliding. Our team of instructor will share their passions for free flight, on one of the most beautiful sites in the world : the site of Forclaz near Lake Annecy !! A takeoff run that is known worldwide, for its panorama and its exceptional metrological conditions. Do not hesitate to contact us for any question, at info@takamaka.fr or by phone at +33 (0)4 50 45 60 61. See you soon in the air with our paragliding school Annecy ! From Friday to Sunday, this formula has proven itself and allows you to learn the same way as during a traditional internship. The course runs from Monday morning to Friday evening. Ideal to quickly learn paragliding in autonomy safely. How to choose an internship at Annecy Paragliding School ? This is the most suitable formula to start paragliding. First two or three days of slope school to learn the handling of the sail and then your first big flights, always under the expert eye of our instructors. This is the formula for people in a hurry, but you may be a little frustrated to be able to do one day of big flights per se! In fact it is an ideal formula for people living in the area, but can not block 5 consecutive days. 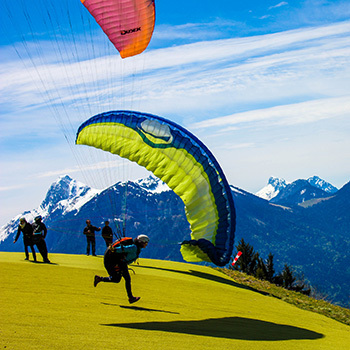 You can then do several courses of paragliding of 3 days in a rather close period. You want to try paragliding before you start an internship? So, make a first flight with one of our instructors, it’s an easy solution to discover the sensations that this magical activity brings! For more activities, discover our videos and our different outings ! 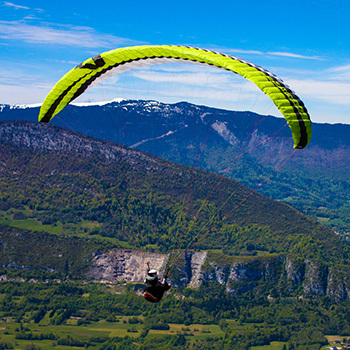 A question about our paragliding school Annecy? We offer several baptisms or flights sensations in line with your desires! Our professional instructors are there to make you live an exceptional moment. For those wishing to experience a paragliding flight for the first time, we propose tandem flight . Whether you dream of a smooth flight or a flying sensation, you choose !